Simon Longman’s new play highlights the cyclical bleakness of village life. Simon Longman’s new play Island Town is set in a forgotten British village. Its specific location is left intentionally ambiguous, but Longman, who won the 49th George Devine Award for Most Promising Playwright, makes brutally clear the desolate and neglected nature of the town. These abandoned British-scapes are the places that interest Longman, whose recent play Gundog, which premiered at the Royal Court, is set on a bleak and isolated farm in England. They’re where you find Longman’s steady, disquieting and lyrical poetry, weighed down by a harsh and cruel environment that offers little hope for its inhabitants. 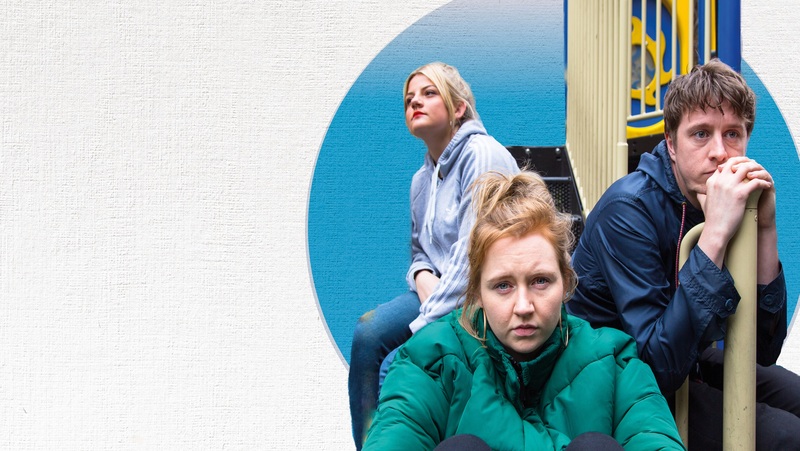 This world premiere sees three 15-year-old friends Sam, Kate, and Pete loitering about town, nicking bottles of cider and scrounging enough money for the regular drug run. Their family lives, each in their own way damaging and alienating, remain peripheral but influential to their friendship. Their reliance on each other is at times another way of escape, comforting yet also paralysing. But they also find communion in dreaming of a better future, and Longman makes palpably clear that amidst what seems an inescapable tragedy endured by these friends there lies a real, admirable and heartbreaking love. Director Stef O’Driscoll has actors Katherine Pearce, Jack Wilkinson, and Charlotte O’Leary jolt through the characters’ teenage years as they reach adulthood, snapshots of their adolescence crystallized with their dreams as unchanged as their reality. But however excited Pete (Wilkinson) is about having kids, or driven Sam (O’Leary) is about looking after her young sister, Island Town underlines the cruel underside to dreaming. Dreaming itself is cast as a crucial part of the cyclical curse that perpetuates and even solidifies life inside in the ring road. A good deal of humour arises between friends, including Pete admitting to snogging Sam’s nan at a party. Strong performances and skillful directing highlight these moments of levity, but the excellent acting is best seen during moments of tenderness between friends. Pearce’s Kate has a churning rage never far from erupting, Pearce also endows her with a real longing to be loved. There is however a somewhat overwrought ending that feels redundant given the elegant and detailed storytelling that comes before. Its literal depiction of the overarching metaphors almost sensationalizes the tragedy. Longman chooses to have the form of the play reflect the content, demonstrating the cyclical processes of these forgotten towns. It is effective but it’s also a bit cliched. Island Town is on at Roundabout at Summerhall until 26 August. Click here for more information.